In this answer I computed (methods given later in post) the estimated time, distance, range, and resolution for the science capture for New Horizon's closest approach to Ultima Thule (2014 MU69). While looking through the images on APL's website I noticed a discrepancy in one set of values. 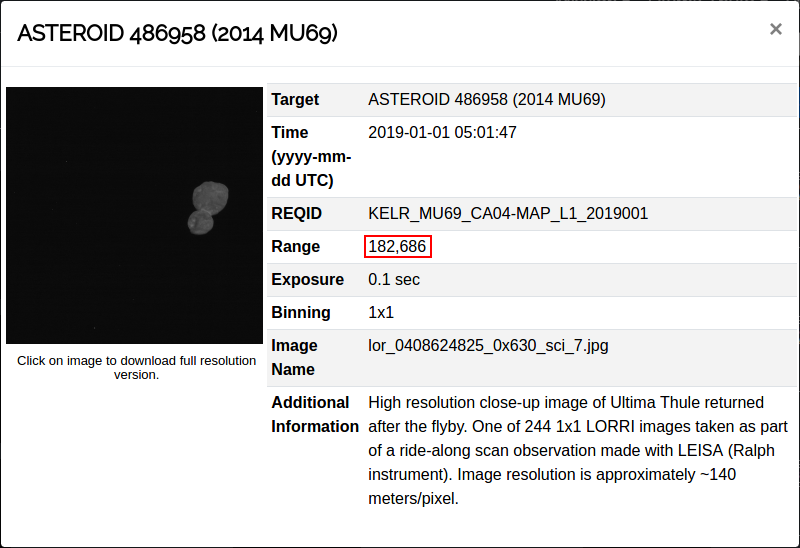 Specifically, the numbers given for Range for all of the LORRI images from Ultima Thule on that site appear to be about 6.5 times too large bear no relation to the computed range. All of the rest of my results seem consistent except for that figure. Can anyone explain why I'm seeing a discrepancy? To be clear, I'm focusing one image here but I've seen similar for all of the LORRI images at Ultima Thule. 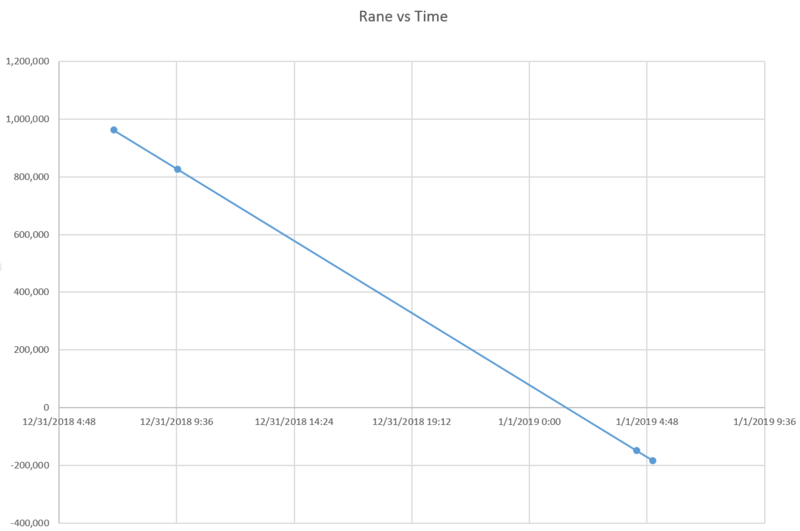 Here's a sample of my results for the time around when the above image was taken. Everything matches except for Range where I get ~28000 km and they list "182,686" (with no units given). For the Pluto encounter they used Mkm so having the units for this be km would make sense. The value they show though is about 6.5 times larger than what I computed. The "range" given doesn't seem at all related to the actual distance (or at least not consistently between image sequences). I tried miles, feet, etc. but nothing (except tenths-of-a-mile) comes close to fitting. Any ideas? Is it in in tenths-of-a-mile? Have I missed something obvious? Other images from the Ultima Thule encounter show similar discrepancies. Update: The "range" values for the raw images don't appear to be tenths-of-miles. They also don't seem to go in sequence between observation sets (CA01, CA04, etc.) but they do go in sequence within a set. Maybe it's something to do with transmit time or distance? Estimated from distances shown in the Imaging schedule diagram (see below). Negative for approach, positive for departure. Accuracy is about ±50 km. Note that UT's position is ±4000 km; I ignore this margin of error (assume it to be 0). Derived from time based on closest approach of 05:33:30 SCET (based on "05:33" from here). Format is hh:mm. JHUAPL gives a more precise value of "05:33:00" which is 30 seconds earlier than what I used in my calculations. Value is currently estimated as 3540 km; value used is 3500 km. Values shown in table are rounded. Note that image resolution is computed from this. That result matches the published values. I've looked through your numbers, and they do seem to be correct. The range values included are likely intended to be in km, but seem to be inaccurate. The range values are not official at this point in time, and do not have access to the spacecraft ephemeris data yet. I suspect when that data comes down the range values will be estimated better. Bottom line, both the range and the distance based on the size give similar values, for the highest resolution photographs, both of which are very far off of the values provided. In fact, the values are obviously wrong, the larger, and therefore closer, picture has a larger range then the smaller target. Doing some further analysis, I believe the range values are assuming a closest approach of about 01:30 SCET. That is 4 hours off, which just happens to be the 4 hours difference that EDT is from UTC. My guess is that they had the time zone wrong for the range estimates, and never noticed it. Here's a plot of what the data looks like, assuming a negative range after the closest approach. Seems pretty linear to me. I mentioned this to Alan Stern on Twitter, hopefully they can address it. Update: As of 2019-01-17, the page has been updated with range figures more in line with what you've calculated. You're deriving the range from the timestamp. Are you sure there's no discrepancy there? I thought it might be a difference between spacecraft local time and received-on-Earth time, but that's not it: you'd be 6 hours out then. A difference of 100,000 km translates to about 2 hours of flight time (at 14 km/s). They seem to be using the same file name convention on the JHUAPL site. Directory names are not visible. Not the answer you're looking for? Browse other questions tagged mathematics new-horizons remote-sensing 2014-mu69 or ask your own question.